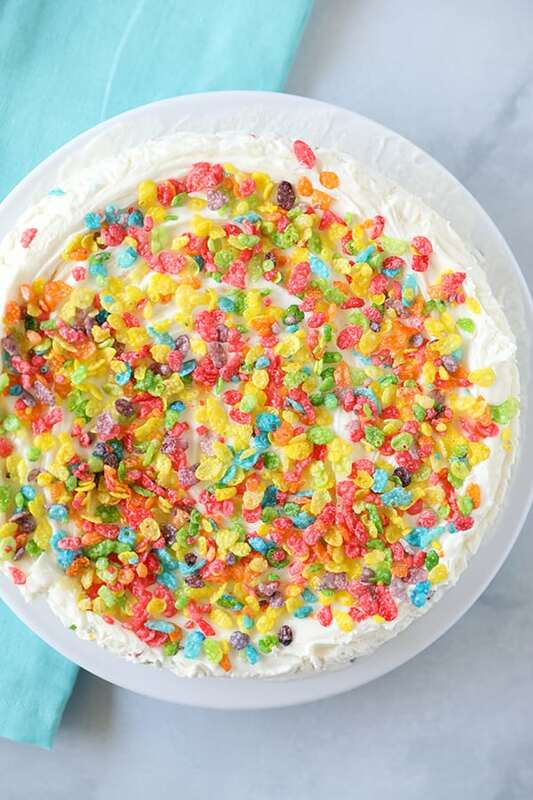 This Fruity Pebbles No Churn Ice Cream Cake is fun to make and fun to eat! 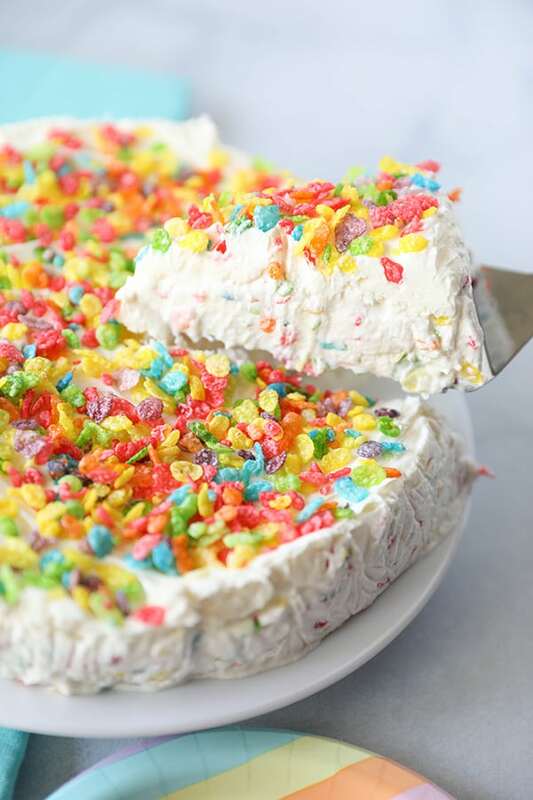 Creamy homemade ice cream with a colorful sprinkle of Fruity Pebbles cereal and a layer of vanilla frosting, it’s a great no bake alternative to cake that just happens to be gluten free! 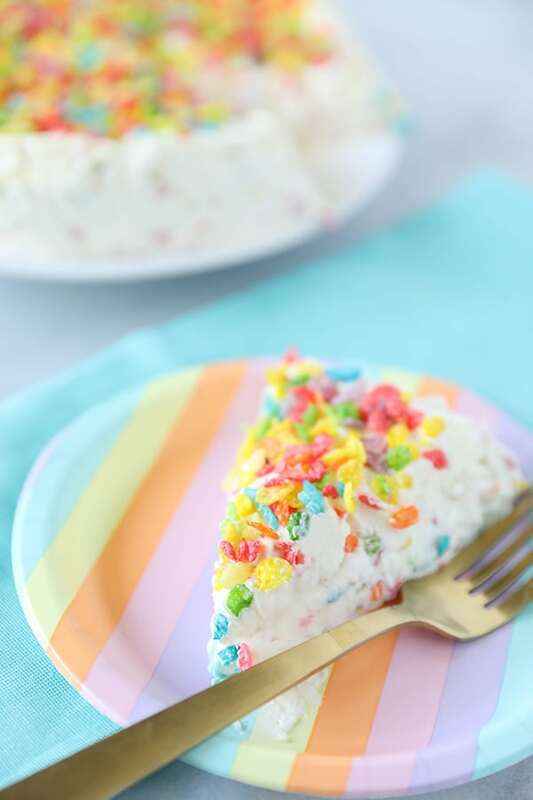 This colorful ice cream cake is a perfect alternative to a traditional cake! Start by whipping the heavy cream in a stand mixer until stiff peaks form, then stream in sweetened condensed milk, vanilla extract and a pinch of salt. Then, stir in the Fruity Pebbles. Now if you want, you can stop here and freeze the mixture and have homemade Fruity Pebbles Ice Cream. 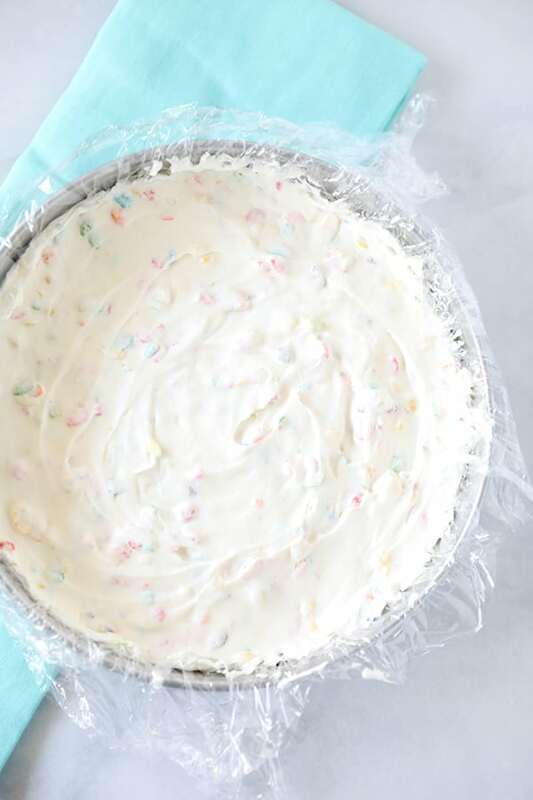 But we are going to turn this into an easy no-bake ice cream cake that is perfect for a party! Once the ice cream mixture is prepared, transfer it to a plastic wrap lined springform pan and freeze for about two hours, or until the top is firm to the touch. 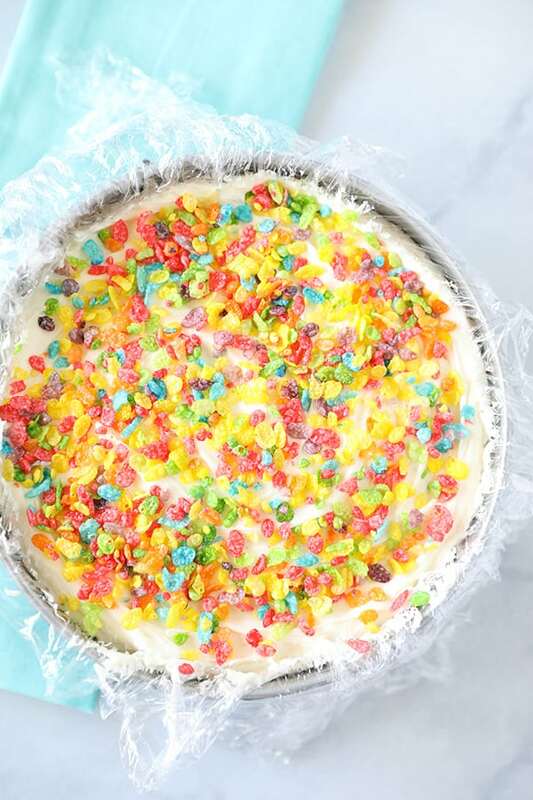 Once the top has set, spread with vanilla frosting and top with additional Fruity Pebbles. Return to the freezer for 4 more hours, or overnight. Then serve! 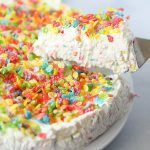 This Fruity Pebbles No Churn Ice Cream cake also happens to be gluten free! Line a 9 inch springform pan with plastic wrap. In the bowl of a stand mixer, beat chilled heavy cream until stiff peaks have formed. With mixer on low speed, slowly stream in sweetened condensed milk followed by vanilla extract and pinch of salt. Stir in Fruity Pebbles. Transer mixture to springform pan and freeze until firm, about two hours. Remove from freezer and top with frosting and additional sprinkles. Return to freezer and freeze until completely set, 4 hours or overnight. To serve, remove sides of springform pan. Then, place a clean cutting board on top of cake and gently turn over using the cutting board as support. Quickly remove the plastic wrap and turn cake back over onto a serving plate.